When we think about the people behind our food, the familiar faces at the farmers market may readily come to mind. But the many other individuals who do the hard work of planting, growing, and harvesting that food may remain only a distant picture for us. These agricultural workers, who often have specialized skills and many years of experience, are generally among the least recognized and respected members of our food system. As socially conscious eaters know, farmworkers are excluded from federal labor laws that guarantee the right to organize and, in some cases, they are not afforded basic protections such as minimum wage, overtime pay, and workers’ compensation. According to the US Department of Labor, three-fourths of agricultural workers earn less than $10,000 annually. At many farms, the employment terms are not spelled out on paper, leaving even greater room for abuses. People of color and undocumented workers fare the worst in this system. Even on organic farms, although workers are exposed to fewer toxic chemicals, the labor conditions aren’t necessarily much better. As recently reported in Grist, however, a growing “domestic fair trade” movement aims to formally recognize and reward farms that are working to address social justice. 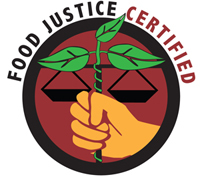 The Agricultural Justice Project (AJP) has developed a set of fair labor guidelines under the Food Justice Certified label, which was born out of dissatisfaction with the US National Organic Program’s failure to address workers’ dignity and rights. While more than 70 Canadian farms are Food Justice Certified, only eight in the United States have received certification. There is now a burgeoning effort to bring the label to California, with Santa Cruz County-based strawberry grower Swanton Berry Farm among those leading the way. Last week, the AJP conducted a certification training at Swanton Berry Farm for representatives from such organizations as California Certified Organic Farmers (CCOF) and Líderes Campesinas. Over the last few years, Swanton has been a testing ground for the Food Justice Certified program, providing input as AJP has developed their standards. “They (Swanton) have put a lot of attention into making the relationship between the farmers and managers and the people who work on the farm different from what you so often see in agriculture,” says AJP co-founder Elizabeth Henderson, who helped lead the training. As the first organic farm to sign a contract with the United Farm Workers of America, the nation’s largest farm labor union, Swanton is considered a model of fair agricultural labor practices. Workers are guaranteed a decent pay scale as well as benefits such as health insurance, a retirement plan, and paid time off, plus access to affordable housing. The farm helps workers avoid repetitive strain injuries (the most common type of injuries in agriculture) by offering a variety of work. In addition, Swanton makes an effort to involve workers in business decisions. Swanton was also the first farm to offer its employees the opportunity to own stock in the company. Certification requires both a third-party certifier and a worker organization to conduct interviews and verify that employers’ claims are true. From the initial assessment to the final audit, the whole process can take about a year. If CCOF signs on as a certifier, they plan to offer Food Justice Certification as an adjunct to their organic inspection, making the process less onerous and costly for cash-strapped organic farmers. To share the costs of getting the certification program up and running in California, it will take a team of dedicated stakeholders. AJP and Swanton have participated in outreach to regional farms and organizations to build awareness about the program, but Brown admits that they have much more work to do in order to achieve a critical mass. “A lot of farms don’t see the need because there isn’t a whole lot of consumer demand,” Brown observes. For eaters who want to see the Food Justice Certified label, she recommends opening a conversation with farmers, food vendors, grocery stores, and restaurants, as well as reaching out to organizations invested in sustainable agriculture. Getting buy-in from all levels of the food chain, particularly institutional and retail purchasers, is crucial. “The good news is there’s growing interest in the social relations of organic production and agriculture in general,” she adds. For AJP, the ultimate goal is to transform not just labor on farms but all aspects of the food system, which represents 20 million workers, most of whom are among the lowest paid in our workforce. They hope to expand the program by working with organizations such as Restaurant Opportunities Centers United and Food Chain Workers Alliance. While creating a socially just food system is a long row to hoe, Henderson sees the Food Justice Certified label as an important first step. By offering tools and support for farmers to evaluate and improve their labor policies, the AJP intends to raise awareness about the vital role workers play in a sustainable food system. Photo courtesy of Swanton Berry Farm.